IT companies of Azerbaijan and Belarus have discussed cooperation prospects in the field of telecommunications and information technologies, a source in Azerbaijan’s IT market told Trend on May 16. 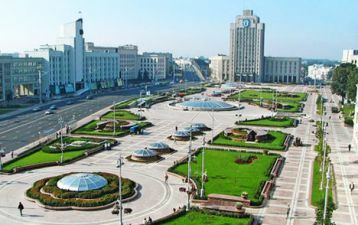 The sides held a meeting in Minsk within the framework of the fourth Belarusian-Azerbaijani business forum in the field of high technologies and telecommunications held as part of the 25th International Forum on Information and Communication Technologies TIBO -2018 held on May 14-18. At the expo, Azerbaijan’s delegation is headed by the director of the department for science, technology and information society development of the Azerbaijani Ministry of Transport, Communications and High Technologies, Rashad Azizov. Azerbaijan's achievements in the ICT sector are also presented at TIBO-2018. Visitors to Azerbaijan’s pavilion will be able to familiarize with such projects as construction of a regional innovation zone, as well as with achievements in the field of the space industry, the "e-government" project, etc. Minister of Communications and Informatization of Belarus Sergey Popkov has visited the national pavilion of Azerbaijan. TIBO Forum is annually held in Belarus and represents a platform for the exchange of new achievements and best practices in the IT field. Several thematic areas are highlighted within the expo, including "National Information Infrastructure", "Digital Economy", "Mobile Technologies", "Electronic Government", "Robotics" etc. Over 100 exhibitors from more than 20 countries take part in the exhibition.